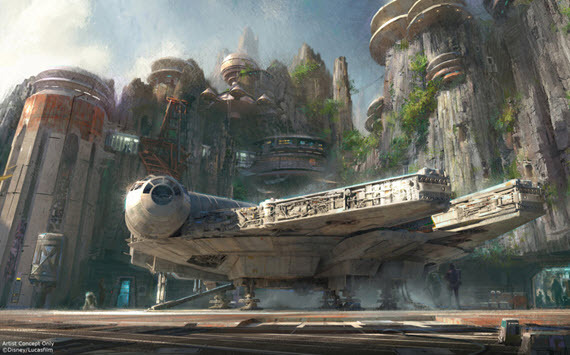 Disney unveiled plans for new Star Wars themed lands at its parks at its D23 Expo 2015 event. The new park attractions are not entirely unexpected following Disney's acquisition of Lucasfilm in 2012. They also tie-in with the return of Star Wars films in theaters, starting with Star Wars: The Force Awakens on December 18, 2015. Disney says the new lands will be coming to Disneyland park in Anaheim, California and Disney’s Hollywood Studios at Walt Disney World Resort in Orlando, Florida. The company says these are the largest single-themed land expansions ever. They will each be 14 acres in size. The concept art gives an idea of what the Star Wars lands will look like. They include a never-before seen planet and a remote trading port. One of the attractions will let visitors control the Millennium Falcon. Disney CEO Bob Iger said in a statement, "I am thrilled to announce the next chapter in the long and exciting history between Disney Parks and Star Wars. We are creating a jaw-dropping new world that represents our largest single themed land expansion ever. 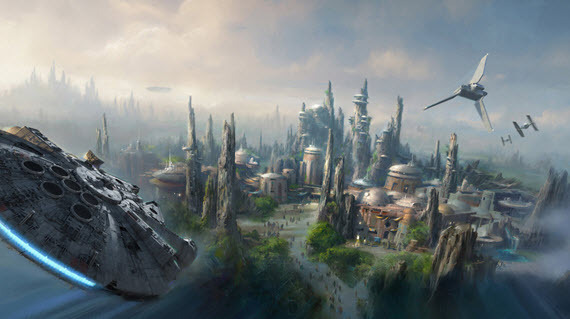 These new lands at Disneyland and Walt Disney World will transport guests to a whole new Star Wars planet, including an epic Star Wars adventure that puts you in the middle of a climactic battle between the First Order and the Resistance." The new Star Wars lands are likely to be a major draw. Disney is intent on making Star Wars bigger than ever with more movies, toys and attractions. Fans of the franchise have been eager for more for years and all expectations are that the new film will be a blockbuster in December.